Walking into Athens is a step back in time. The city began as a village, blew up into a metropolis and has cycled in glory and defeat for centuries. The historical successes of Greek accomplishments of democracy, astronomy and philosophy were predominantly within the 5th and 6th centuries BC. The other years were controlled by disjointed reigns of Greeks, Persians, ottomans, Romans and even Germans. 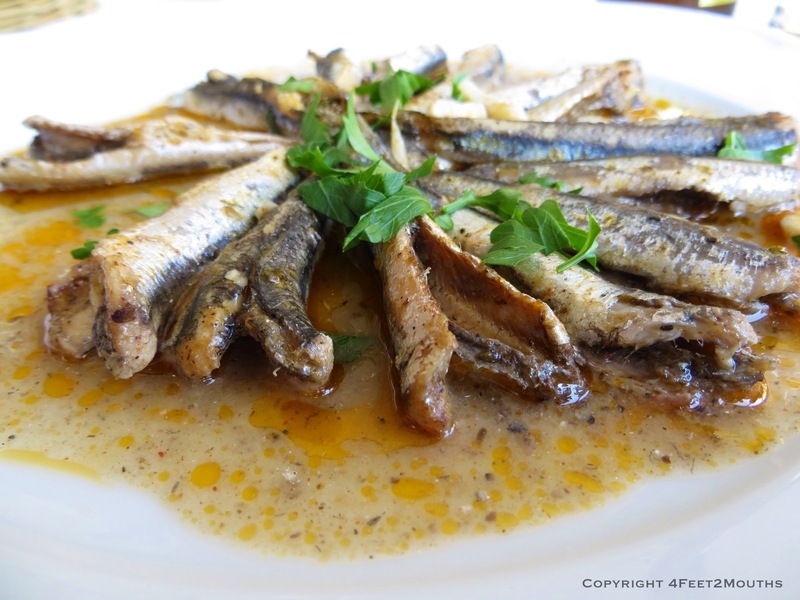 It is the modern Greece that we visited- rich in culture, deep with history, vibrant with hospitality and delicious with Mediterranean food. 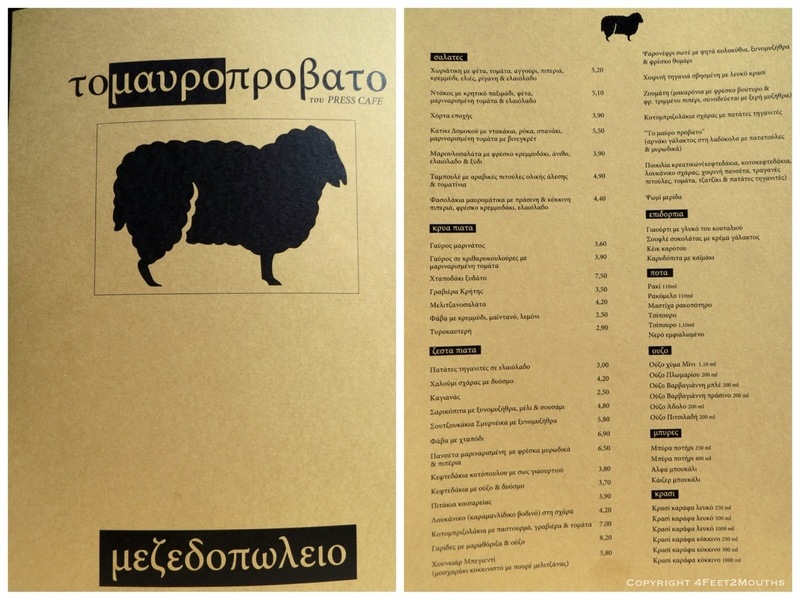 People had warned us not to spend much time in Athens as it was an unattractive city. This confused us since we had always related Athens to Rome and we expected centuries of history from the once glorious civilization. Wouldn’t the city be full of beautiful architecture? We learned that at the end of 4th century BC the population of Athens has dropped significantly to village-like numbers. 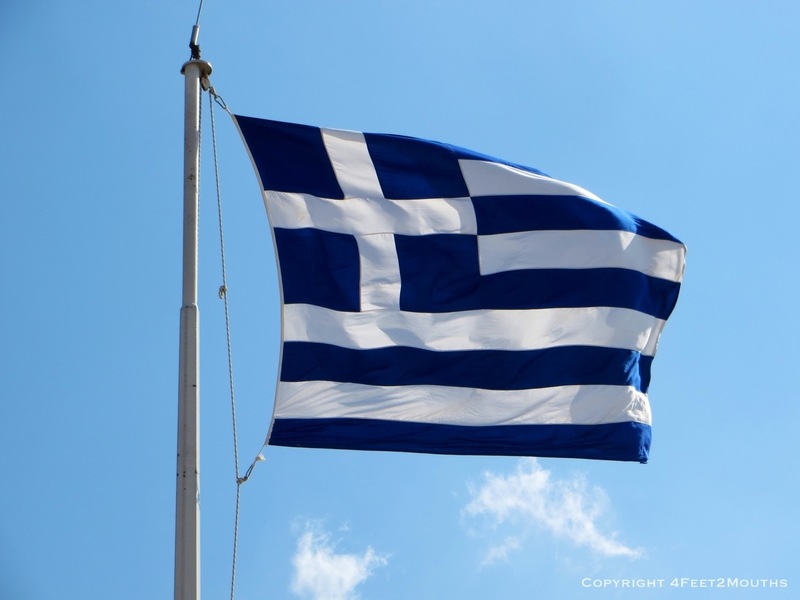 The city’s population of today can be directly attributed to the Greek/Turkish people’s exchange of 1923. Thus, the city is rather modern in feel with large boulevards and rather plain buildings. 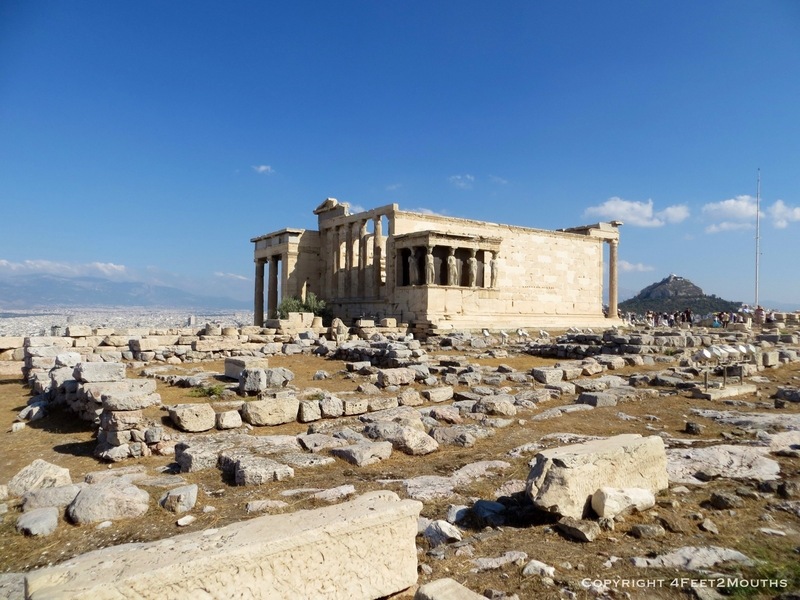 The spectacular sight is the mountain in the center of the city, the Acropolis, that prominently holds beautiful temples that are 2,500 years old. Everything shows evidence and elaborate detail and a passion to build fantastic structures. The Romans emphasized the use of the arch, but much earlier, the Greeks designed buildings with brute force by increasing the frequency and number of columns. 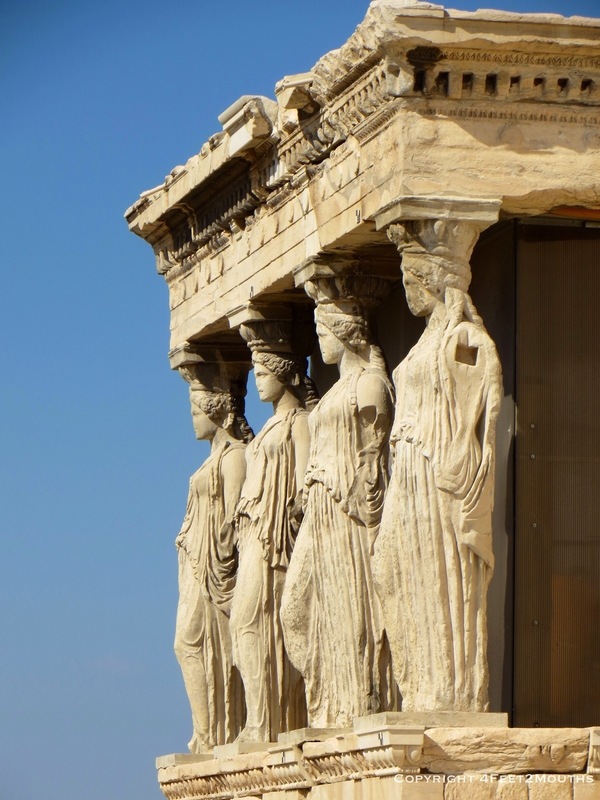 One of my favorites was the Caryatids, the female carved columns supporting the porch of the Erechtheion. 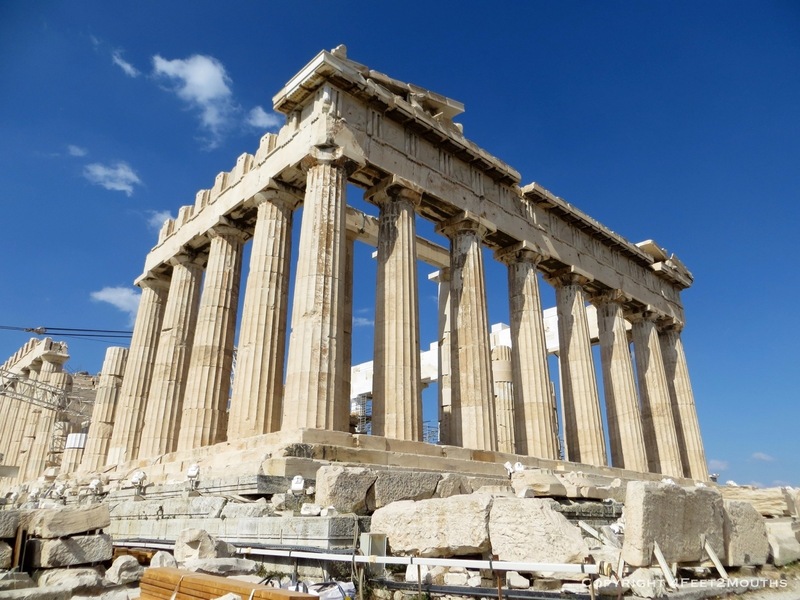 The grandest of all is the Parthenon, an enormous building for 2 1/2 millennia ago. And they even bulged and tapered the columns to create an optical illusion of greater height. 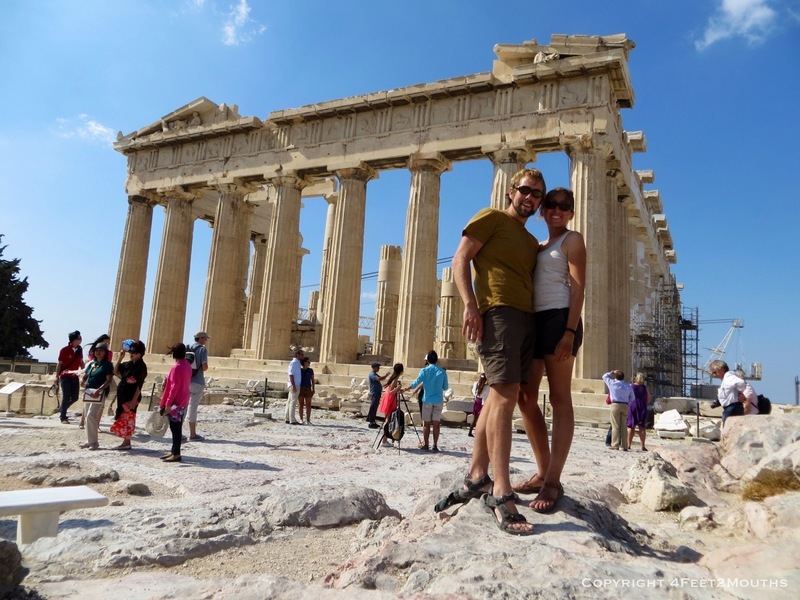 The Parthenon and Acropolis are beautiful, but all this history tends to make our heads hurt and stomachs growl. We descended the mountain and found one of the numerous souvlaki shops. We watched as they sliced off pork and chicken from the sizzling and rotating spike. 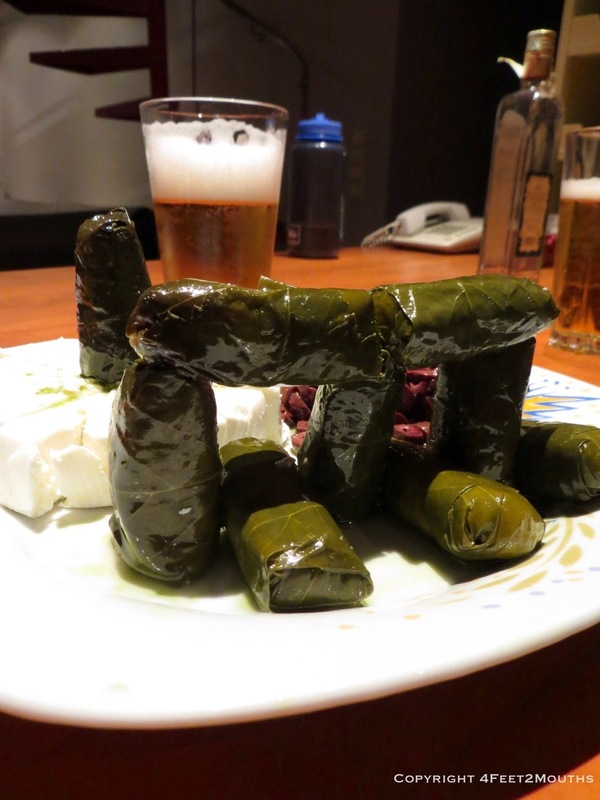 It was stuffed into pita with lettuce, onions, tomatoes, tzatziki (yogurt, cucumber and parsley) and what’s this? Fries. 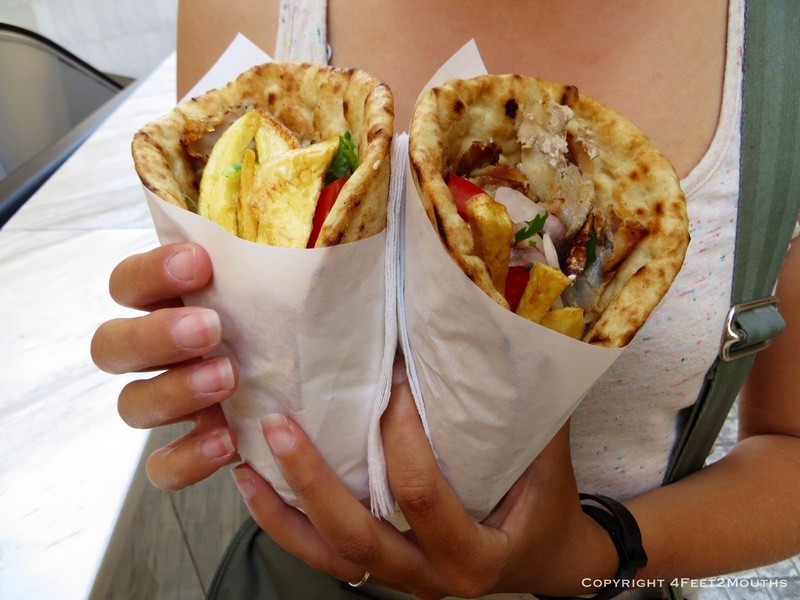 Mmm we found Greek street food, gyros. We hit all of ancient sites. 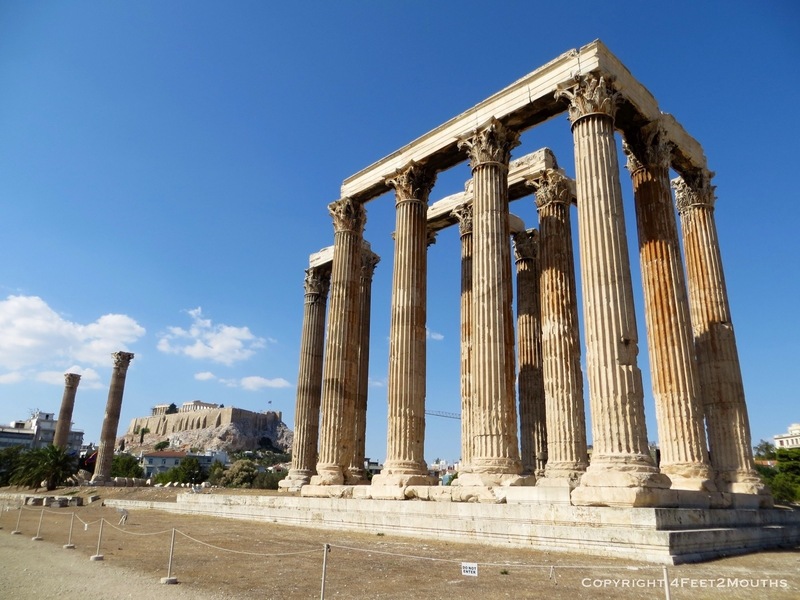 The Temple of the Olympan Zeus showed roman perseverance to complete great temples. There were countless marble statues majestically glorifying gods, heroes, distant queens and prominent merchants. Keramikos was an ancient grave yard and Mount Lycabettus provided stunning views of the city. Ancient ruins are tucked all over the city. 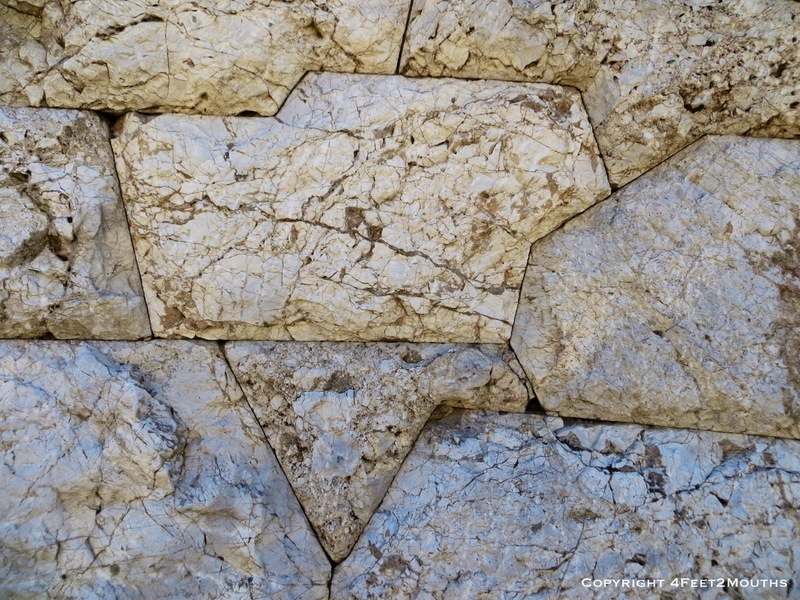 The stonework of the Romans showed that many angles and superior tightness could be done 1,500 years before Machu Picchu. 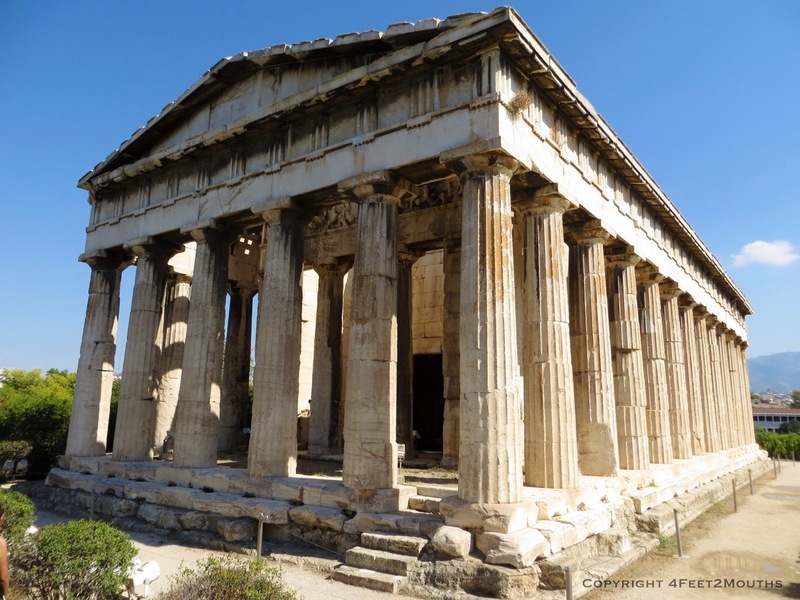 The temple of Hephaestus is almost entirely intact, and it was built in 400BC. It has taken no time for us to adjust to the Mediterranean food here. 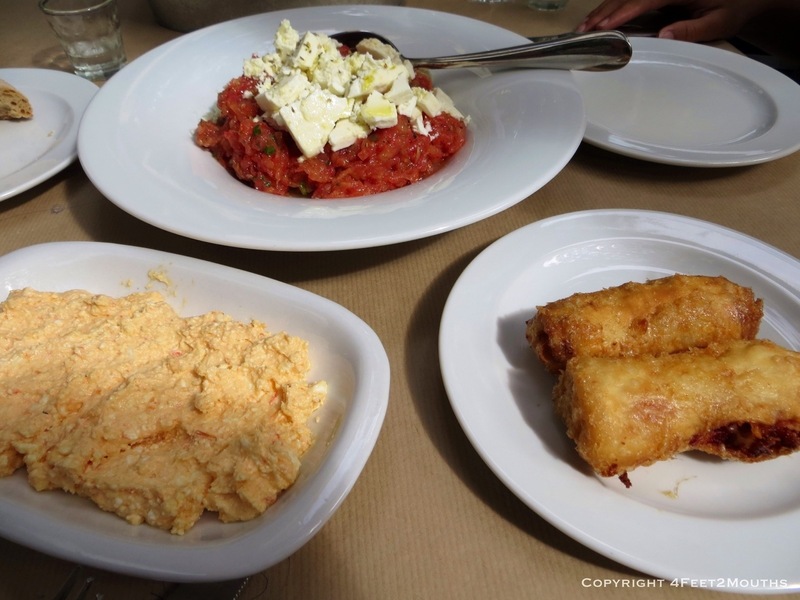 A plate full of gavros (whitebait), baked feta cheese and puréed fava beans made an amazing meal at Cafe Absynna. 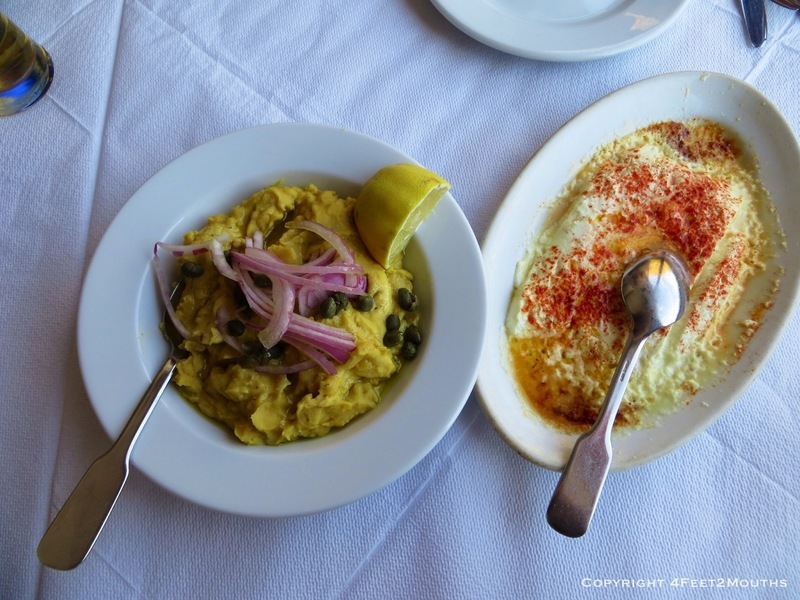 We lingered at our table overlooking a small plaza, but we wanted a place with more action. 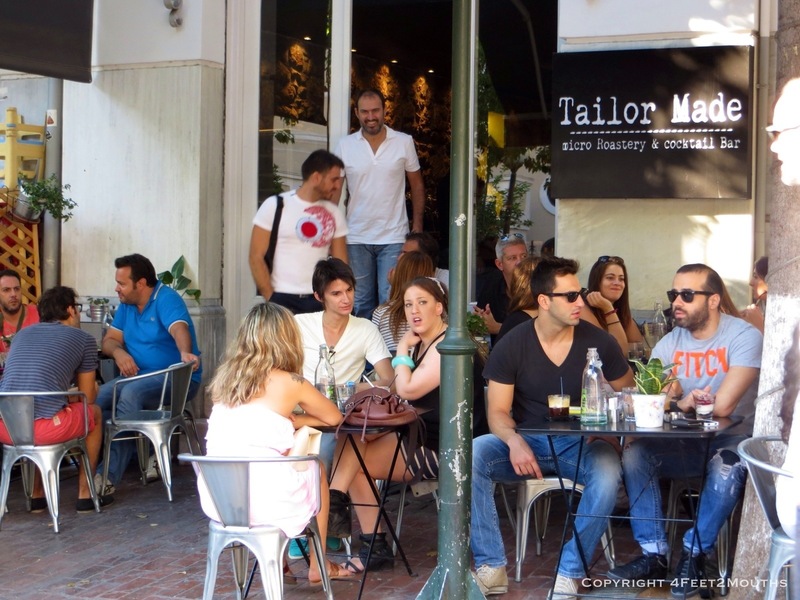 Tailor Made demonstrated the cafe culture we wanted. They served delicious coffee and cocktails with a chic rustic atmosphere. The cafe was in a tranquil neighborhood but there were still acres of graffiti on the surrounding buildings. 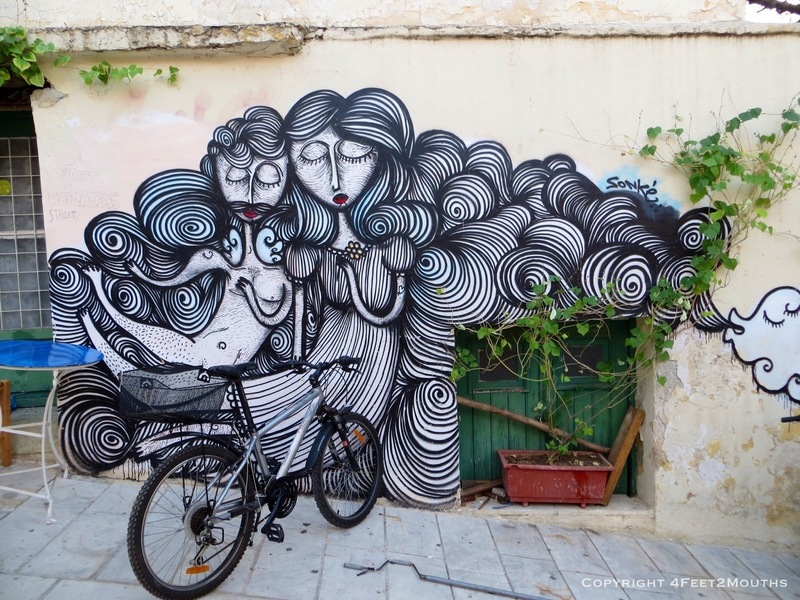 We wondered if the graffiti had increased due to the protests surrounding the economic crisis. 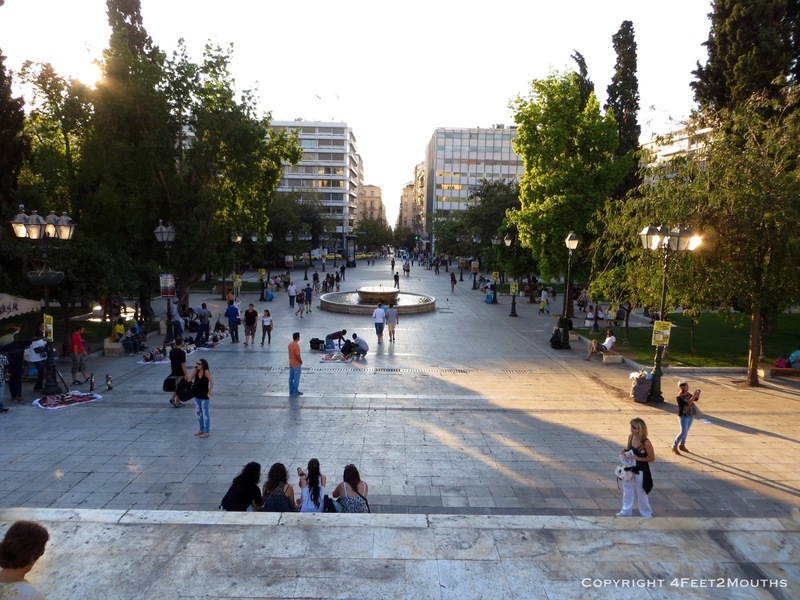 Much of the craziness in the last few months was in Syntagma Square which was calm when we saw it. Protesters were absent during our stay, but we left town just before the German chancellor arrived and they started up again. In the meantime we enjoyed meandering through the market streets with an occasional pleasant piece of urban art. 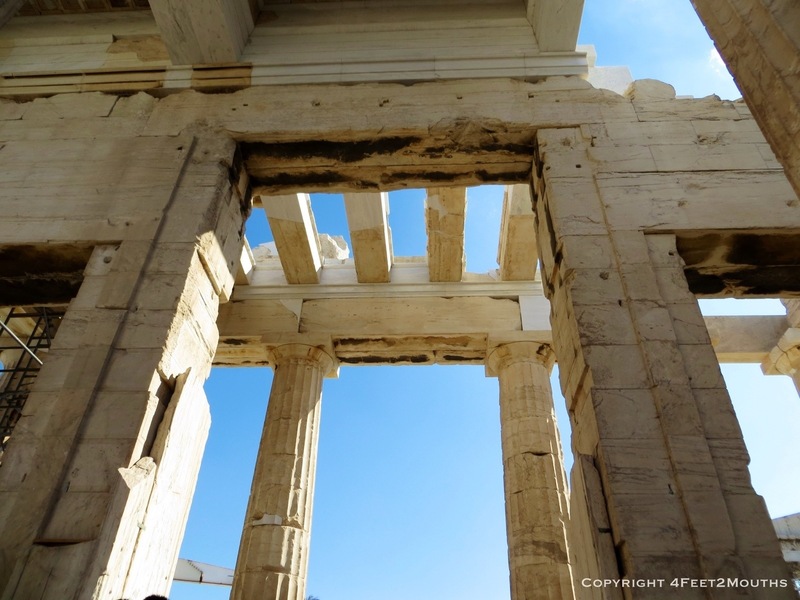 One factor making our Athens experience so great was the smooth transition into the city, culture and food. Our friend Theodoros took us to a rock ‘n’ roll/swing dance party, hosted us in a beautiful apartment and deciphered Greek menus for us. Greece is the first country in the last ten months where we have not been able to use Spanish or English. 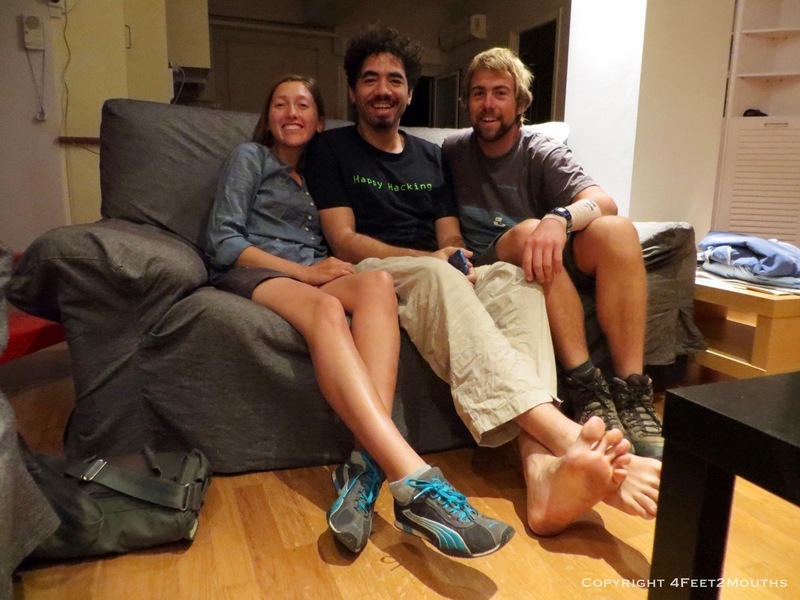 It was special to know a local in the area to provide insight on Athens and the Greek Islands. Athens is a wonderful city with great people and history, but the beach was calling us. We boarded our early morning ferry and within a few hours we would be in the sun, toes in the sand and crystal waters across the skyline. Great pictures. 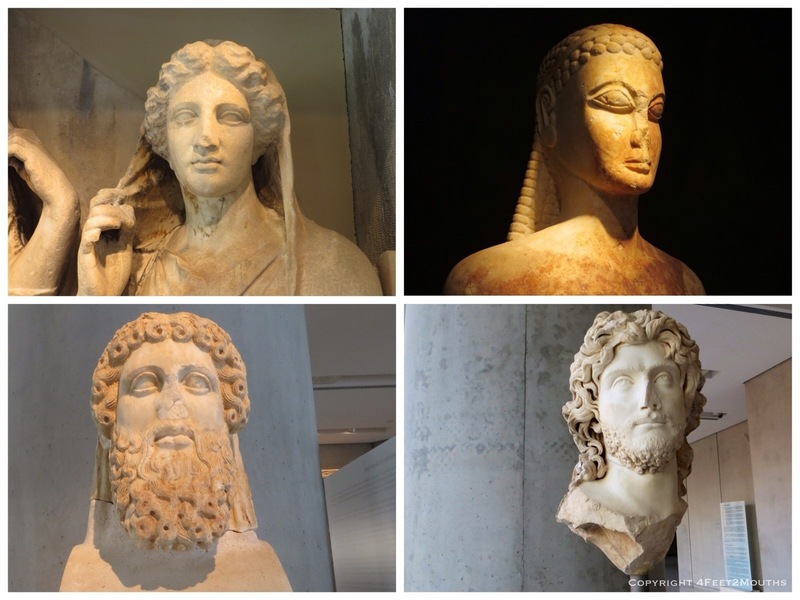 Your post reminded me of my visits to Athens – thanks!